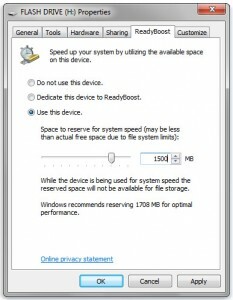 ReadyBoost can speed up your windows based computer by using storage space on most USB flash drives and flash memory cards. How to turn ReadyBoost On or Off? Plug a flash drive or flash memory card into your computer. To use the maximum available space on the flash drive or memory card for ReadyBoost, click Dedicate this device to ReadyBoost. Windows will leave any files already stored on the device, but it’ll use the rest to boost your system speed.